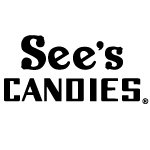 See’s Famous Old Time Candies are well known and loved throughout the West where the company was founded in 1921. Come by to visit and you will find a sparkling clean black and white shop where your candies are packed to order as you make your candy selection. To produce the best possible boxed chocolates, the folks at See’s acquire the finest grade raw ingredients from all over the world. Making over 100 varieties of candies, they have maintained their reputation for excellence by strict adherence to See’s “Quality Without Compromise” motto.